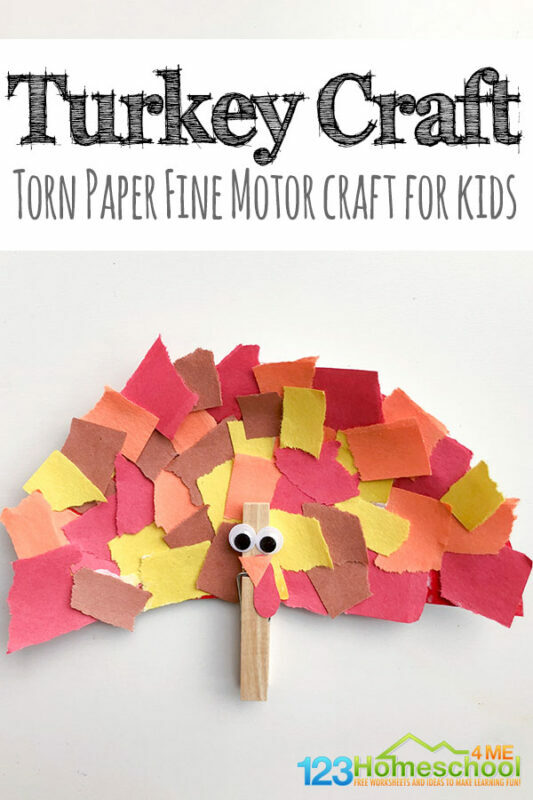 Today we are sharing an adorable Torn Paper Turkey Craft. 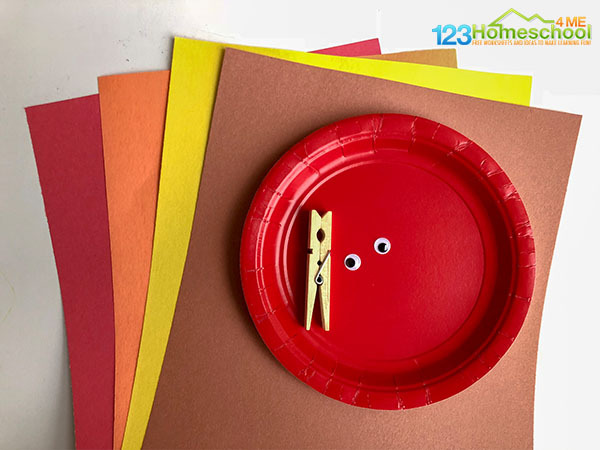 This craft uses simple supplies that you might already have around the house! In just a few easy steps you’ll have a cute little Turkey just in time to decorate for Thanksgiving. This is also a great fine-motor craft. 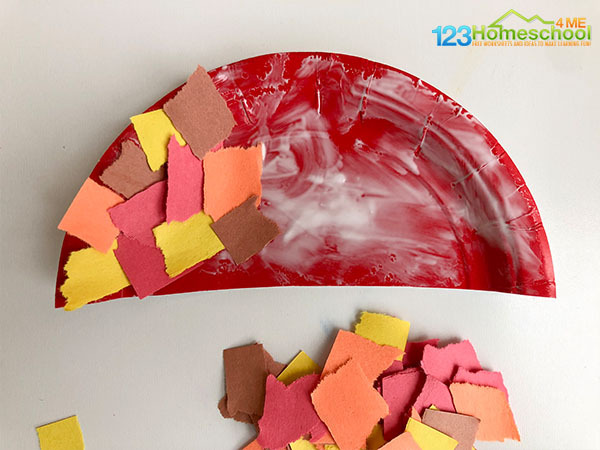 Get those little fingers moving by tearing bits of paper and sticking them onto the paper plate to make colorful feathers! 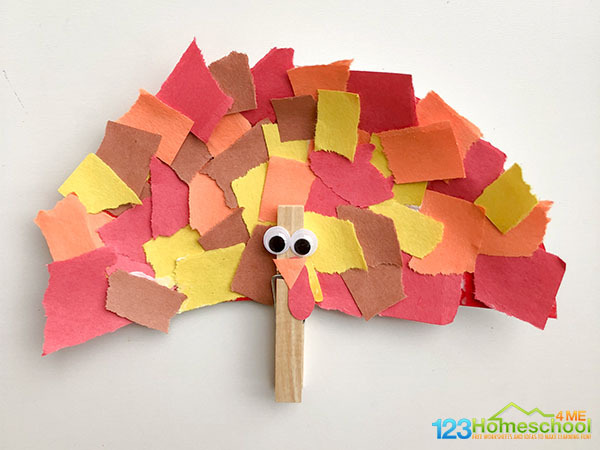 This super cute and fun-to-make turkey craft is fun for kids to make! It doesn’t matter what color the small paper plate is because it will be covered with paper pieces. Feel free to use any colors you’d like for the construction paper pieces. We used traditional Fall colors, but it would also be fun to make a colorful turkey! Before starting this craft with the kids, I cut out a small triangle-shaped beak, and a long, wiggly oval shape for the gobbler/wattle. Older kids may be able to cut these out on their own. First, glue the gobbler/wattle onto the top of the clothespin (the part that opens), as shown. Glue the triangular beak on top of the wattle. Finally, glue the eyes above the beak and wattle. This completes the turkey’s body. Next, we made the torn-paper pieces together. An easy way to do this is to tear strips in the paper first, and then tear off bits from each strip. After tearing bits of paper, it’s time to put your turkey together! Now it’s time to glue the torn paper pieces onto the turkey to make feathers. Spread glue all around the top of the paper plate, and then glue the paper pieces onto the plate, overlapping the pieces as you glue them down. Sometimes it helps to dip the pieces into the glue to help them stick onto the plate. 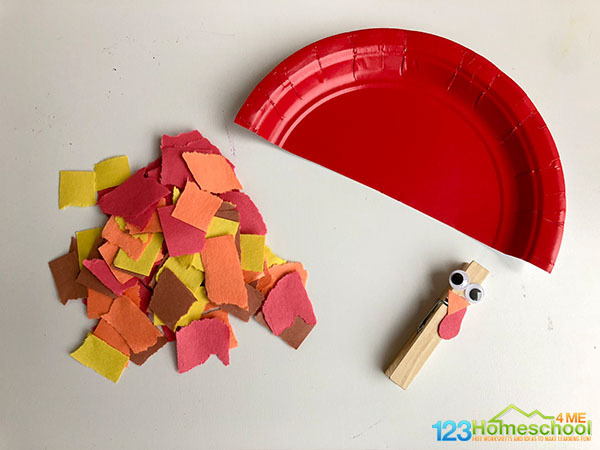 After the surface of the plate is covered in the torn-paper pieces, complete your turkey by simply opening the clothespin and attaching it onto the plate. You can use more glue to make it more secure if you’d like. Now your turkey is complete! This cute little turkey makes a great Thanksgiving decoration and even stands on it’s own.